Jaimie Lundstrom shares how she achieved her ideal French vintage style and how you can too. Set the finished product on your mantle for that French feel. Antique and vintage French pieces are irresistible. Jamie Lundstrom loves decorating with them so much that six years ago she started her blog called So Much Better with Age, a place where she shares her own French-inspired home renovations, projects and creative inspiration. Jamie, who resides in Canada with her family, loves truly old pieces, but she also knows that sometimes you just have to work with what you’ve got. That is the idea behind her new book, French Vintage Décor. With over 70 DIY projects ranging from easy to advanced that give step-by-step instructions on achieving the both aged and elegant looks you’ve always wanted to fill your home, there’s a project for everyone within these pages. Looking for that perfect, antiqued mirror? Or maybe a rustic tray for serving garden lunches? You won’t have to travel to France for these charming results. 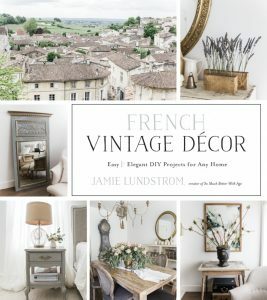 “This book is a place for me to refine my style, share with a new audience even more and create all those projects that I think should go in a French Vintage designed home,” Lundstrom writes. Some projects involve creating almost from scratch, like the whimsical, moss-filled cement bowl or tea bag-shaped lavender sachets. Others involve repurposing. Lundstrom shares how to paint a plain bistro set with a zinc finish and even how to age an urn or planter. “I’m a DIY-er at heart and grew up in a family where do-it-yourself projects were the normal weekend routine,” Lundstrom writes. 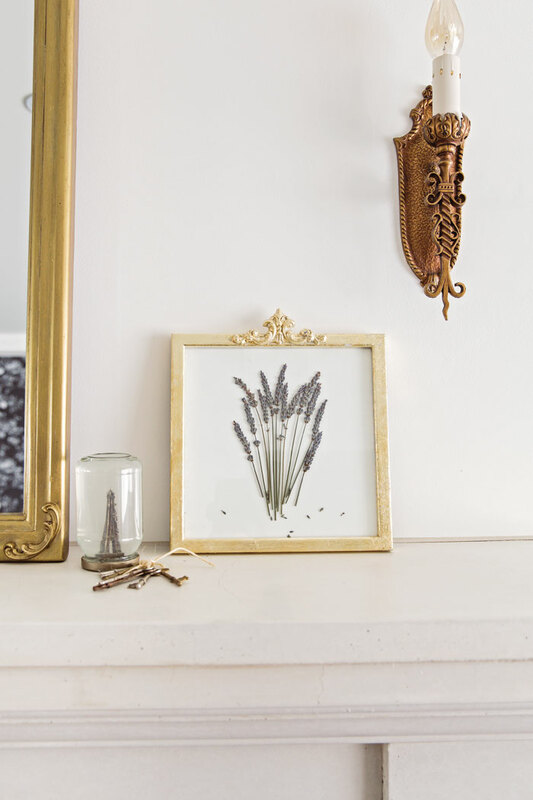 A favorite project is the gold leaf frame with pressed lavender, a two-part process that will add a subtle but intentional touch of elegance to your walls. “Today’s imitation gold leaf is the perfect way to get the expensive look without the expensive price tag,” Lundstrom writes. 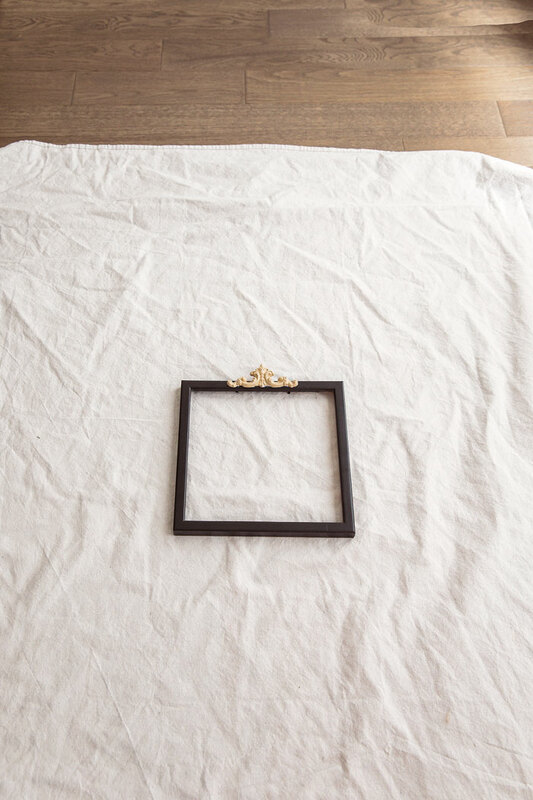 Start with a plain frame and add an ornate wooden appliqué for an extra flair. Some imitation gold leaf sheets applied with gliding glue will finish the job. Adding a wooden appliqué gives the frame an extra flair. To frame the lavender, first let it dry for a day between two paper towels sandwiched within a stack of books. 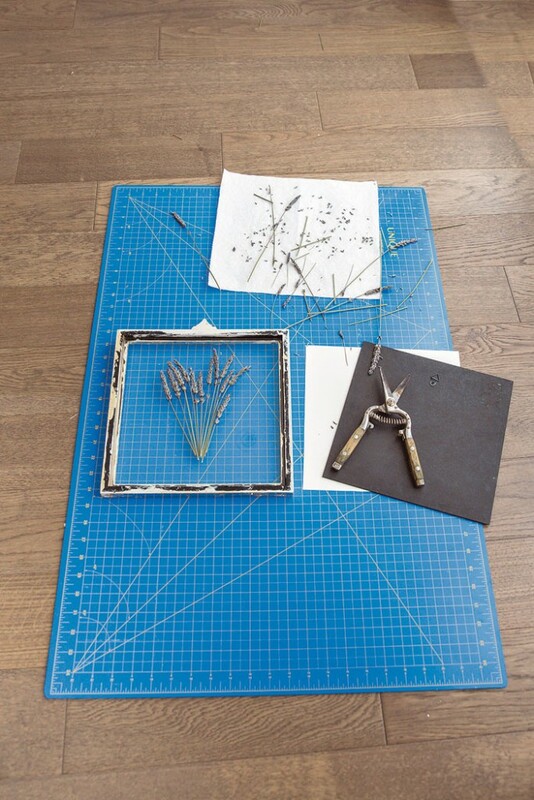 Then, arrange the lavender on the glass of the frame however you would like it to appear. Use a fitted piece of watercolor paper for the backdrop and you’ll have a delicate yet bold French Vintage Décor piece to enjoy. This simple project will give your home the perfect touch of French elegance. To allow both the appliqué and flowers to dry, it is best to do this project over two days. Sand the frame a little where you intend to add the appliqué for maximum adhesion. Then, using the adhesive, place the appliqué on the top of the frame and leave to dry for about 24 hours. Spread the lavender stems across one paper towel and cover with another. Sandwich this between a stack of books and leave until the next day. 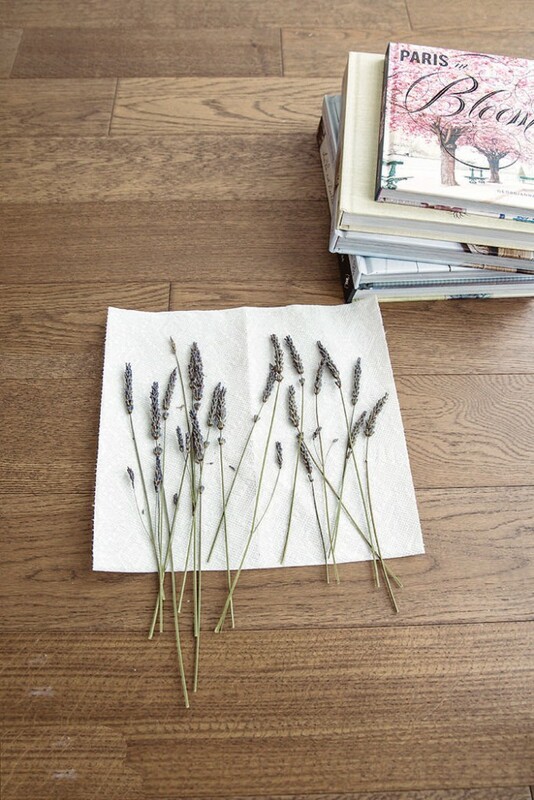 Dry the lavender by pressing it between paper towels and sandwiching it in a stack of heavy books. 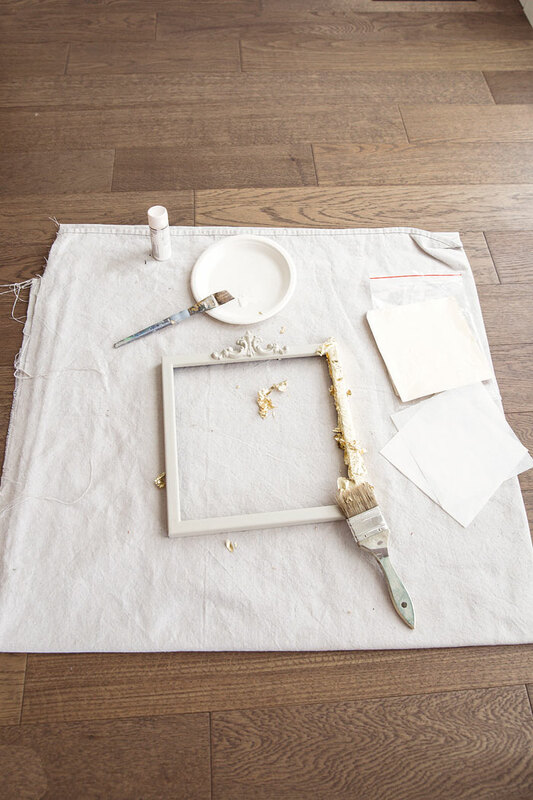 Paint the frame and appliqué with a light color and let dry for one hour. “If you had a dark black frame like I did, you may need to apply a total of 3 coats,” Lundstrom writes. Apply gliding glue to one side of the frame and allow the glue to become tacky for 10-15 minutes. Place a sheet of the golf leaf over the glue and use either your fingers or a brush to press it against the frame. Easily apply the gold leaf sheets with gliding glue and a brush. Continue adding gliding glue and gold leaf sheets until the entire frame is covered. 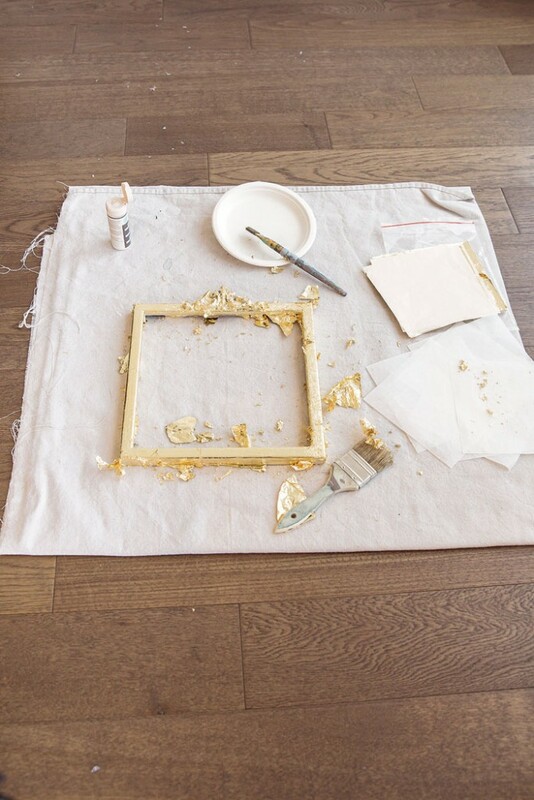 Let the frame dry for four hours before brushing off the excess gold leaf with a dry brush. There may be portions of the frame that are left uncovered. Lundstrom recommends leaving these gaps in the gold leaf for a distressed appearance or adding more to fit your taste. Before you know it, the whole frame will be covered in stunning gold leaf. 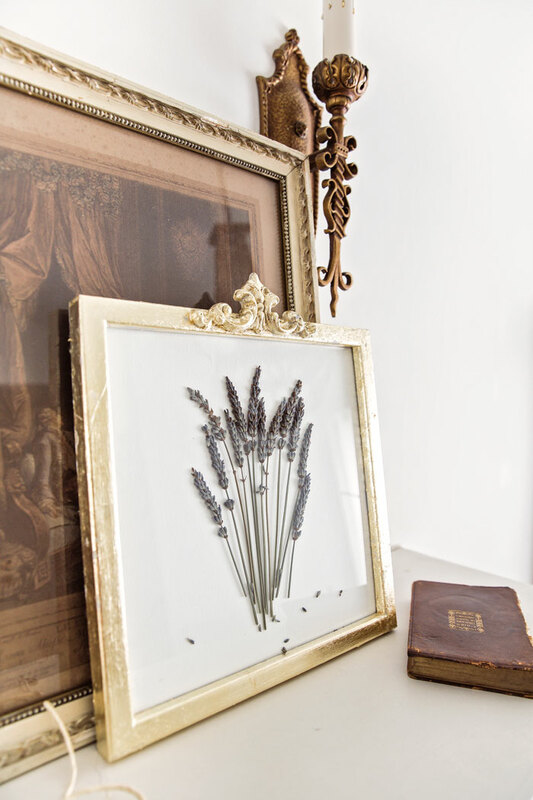 Be sure to clean the glass of the frame before removing the now dried lavender from the books and placing it against the glass in whatever arrangement you like. Play with your design a little. Arrange the lavender against the glass however you like it best. Cut a piece of watercolor paper to fit the frame and add this on top of the lavender as a backing. Put the frame backing in place and find the perfect place to hang or set your unique French vintage creation. Want to see more of Jaimie’s DIYs? Check out her blog and pick up your copy of French Vintage Décor!